The Resalp shuttles operating in the Alpe d'Huez resort meet the Euro6 ecological standards, the most stringent in terms of passenger transport. 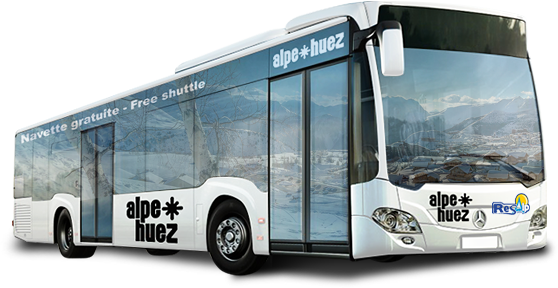 The Autocars Resalp and the town hall of Alpe d'Huez wanted to go further, putting into operation a hybrid bus, the first to operate in the French Alps. If they are at the point of technology in ecology, Resalp coaches providing this free shuttle service are not left out regarding the comfort of its travelers. Everything has been designed so that the service is provided in the best conditions: heating, anti-slip coating, location for ski equipment, boarding and disembarkation facilitated on the numerous stops set up in the resort. At Resalp, security is part of the company's DNA. All the drivers follow a training adapted to the driving on mountain road, and more specifically to the driving on snow. All our drivers are experienced, and knowledgeable about the expectations of travelers on board the free shuttle service.